Pachai Mor Kuzhambu or Raw Buttermilk Kuzhambu is a creamy spiced yogurt dish which is prepared using thick buttermilk. 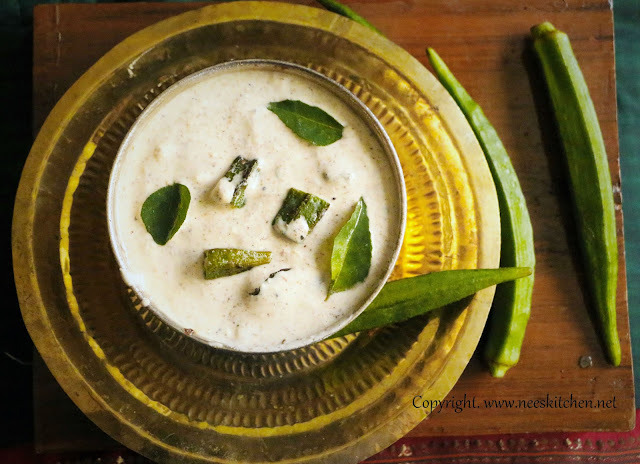 Unlike regular Mor Kuzhambu, in this dish the yogurt is not cooked and can be used at room temperature. 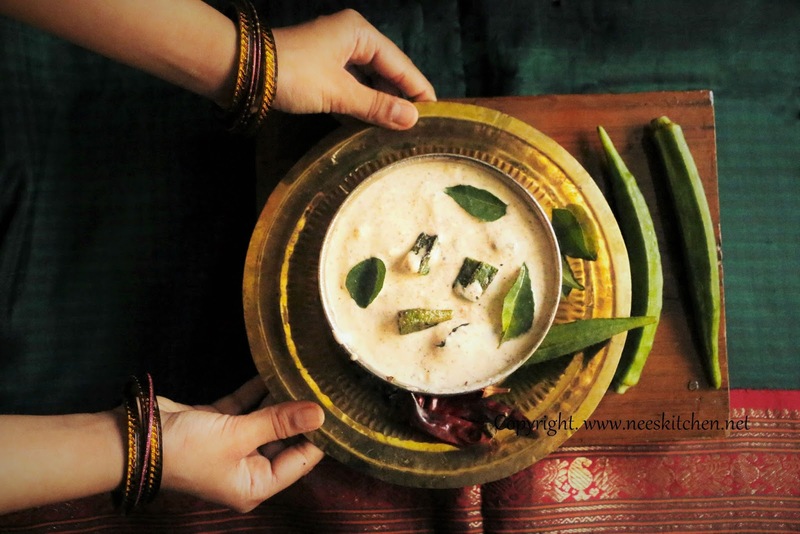 Smoothly beaten fresh thick yogurt is mixed with pre-cooked vegetables & delectable combination of a spice mix which consists of equal proportions of pepper, cumin seeds, chili and urad dhal. The flavor of the dish is further enhanced when we temper it with mustard & garnish with fresh curry leaves & coriander. The spice level of Pachai Mor Kuzhambu is higher due to pepper. However blending of fresh yogurt paste with the spices offsets the spicy flavor. The yogurt has to be fresh and not sour. It goes well when we mix with hot rice with a dollop of ghee and potato fry. Alternatively, you can ignore vegetables in this recipe and use them as a raita. This recipe can be kept in refrigerator up to 2 days. 1. 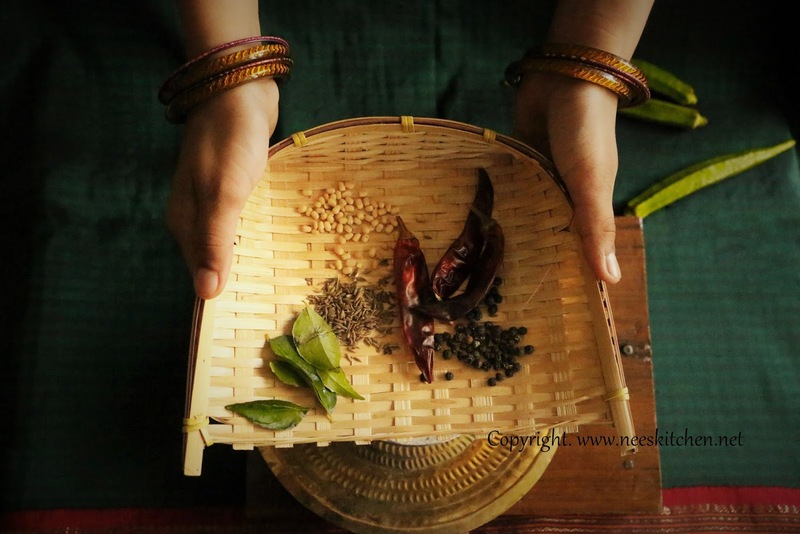 To begin making the Pachai Mor Kuzhambu, take a small but heavy bottomed vessel and dry roast pepper, cumin seeds, coriander seeds, urad dhal, dry red chili, curry leaves and methi seeds on low to medium heat for 3-4 mts. All the ingredients can be combined and dry roasted together. Continue to roast till the ingredients release their flavor. Remove and cool. 2. Take a mortar and pestle, add the roasted ingredients. Grind them to a fine powder. 3. Take the ladies finger, trim ends and cut into 1″ pieces. 4. Heat oil in the same small heavy bottomed vessel, add a generous pinch of hing. Once the hing is fried, add mustard seeds and as they splutter add ladies finger with little salt and fry them well. Remove and cool. 5. In a bowl, beat the fresh yogurt till smooth. Add 1/4 cup (or as needed) water and mix well without any lumps. 6. 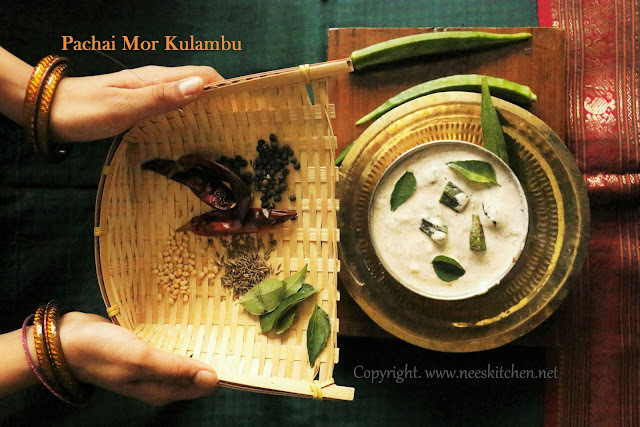 Add the roasted pachai mor kuzhambu powder (in step 2), salt and cooled, cooked ladies finger to the yogurt and mix well. 7. Garnish with fresh coriander and fresh curry leaves. Allow the Pachai Mor Kuzhambu to stay in room temperature. 8. Serve with steamed rice. Ladies finger can be replaced with any boiled vegetables such as potato, pumpkin. Pachai Mor kulumbu was featured in Chennai music season sabha menu after winning a contest conducted by Mount Batten Mani Iyer Catering services - Dec 2016.